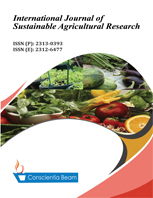 This study analyzed farmers’ propensity to discontinue adoption of yam minisett technology in Anambra State, Nigeria. Data were collected in 2015 with validated questionnaire from 134 proportionately and randomly selected yam farmers. Data collected were analyzed using the Tobit model. Results of the estimation showed that significant variables leading to discontinuance of adopted yam minisett technology were extension visit, participation in extension related workshops, feedback provision, input availability, and perception of yield. Foremost among these factors were extension visits and participated in extension related workshops which therefore should be sustained after farmers have adopted a technology. This study is one of very few studies which have investigated propensity to discontinue adoption of yam minisett technology among farmers, using Tobit analysis. The paper’s primary contribution is finding that determinants of discontinuance of adopted yam minisett technology were extension, participation in workshops, feedback, input availability and yield perception. Tobit, Adoption, Discontinuance, Technology, Yam Minsett, Anambra State. ( 25 ) Farmer’s Decision To Practice Crop Rotation in Arsi Negelle, Ethiopia: What are the Determinants?